I never realized how the course of my life would be so greatly affected by something so simple as a family vacation in 1975. That was the year of my tenth birthday and as a Christmas gift my Grandparents invited my family and myself to spend the month of December with them in St. Croix, USVI. It was there that I saw the ocean for the first time and instantly fell in love with it. Don't get me wrong, I had seen the ocean before as a child at the beach, but nothing back on the mainland could have come close to what I saw there. Everything about that island felt right to me, from the heat of the sun to the salt in the sea, this was where I would always long to be. During the second week of our stay we meet Fritz, the son of the woman whose house we were renting for the month. Fritz was in his late twenties, an island kid of Dutch decent who was soft spoken and very easy going. We bonded right from the start like brothers and for the next two weeks we did everything together. Yes, you could say he was my first idol! I was an excellent swimmer for my age and had no fear of the ocean, I guess that's why Fritz felt safe taking me for 100 to 200 yard swims out to the reef where he taught me to snorkel and spearfish. He also taught me to lobster and body surf, but I wanted to learn to scuba dive and when it was mentioned all I heard was "you're too young." During the middle of my third week the nagging paid off! My Father decided that if I could handle the equipment and the drills in the pool he would pay Fritz to train me and take me diving in open water. Needless to say that before the month was up I had several open water dives under my belt and a wreck dive too. Ever since then I have had a special place in my heart for the ocean and the islands. Unlike my diving career, which I dove into at a very early age, my introduction to underwater photography came much later. I had taken photography classes while in school and knew my way around a camera very well, but taking one under water had, for some reason, never occurred to me. It wasn't until early in 1997 when Colleen Murphy mentioned selling her underwater camera system that I actually thought about it. Colleen was a dive instructor and friend who I helped out with open water classes. In return for saving the newbie's from the bottom of the quarry, Colleen would teach me specialty courses for next to nothing. You just have to love the barter system! In July 1997, after an extensive course in underwater photography with Colleen and her Nikonos V camera system, it was time for a dive trip to see if I could apply what I had learned. We ended up in Key Largo, Florida where we would spend a week diving with a couple of friends who owned one of the local dive charters. I took 18 rolls of film that week and I was amazed at how well the pictures turned out. It was then that I realized how this new hobby of mine would allow me to share my dive trips with family and friends; I could now show people my trips instead of just talking about them. When I returned from Florida I purchased my own Nikonos V camera system including two strobes and I continued using this system until I made the switch to digital in 2002. Since my first exposure to underwater photography back in 1997 I have taken classes and attended numerous seminars for photography, u/w photography and photographic composition. Now, with the digital age well upon us, it has become easier for photographers such as myself to create breath-taking images on every dive trip. The digital camera systems and housings are more expensive, but the image quality and editing power you gain is well worth the added price of the equipment and software. I lost track of Colleen in 1999 after she moved out of the area for her work and in May of that year I ran in to another instructor who led me down a different path in diving. I had always loved wreck diving and up until this point all my wreck diving had been on relatively shallow shipwrecks. I was told that if I wanted to see the shipwrecks only a handful of divers ever get to see I would have to get trained and certified in "technical diving." Well the name say's it all, I was a very technical kind of person and learning new skills and styles of diving was the logical next step in my life. I spent the next four years training with three different instructors who took me from an intro level of deep air/staged deco to the very advanced level of hypoxic trimix. My instructor/dive buddy Matt Harlan and I have spent quite a bit of time in South Florida and off the east coast diving shipwrecks in 150 to 300 feet of water. 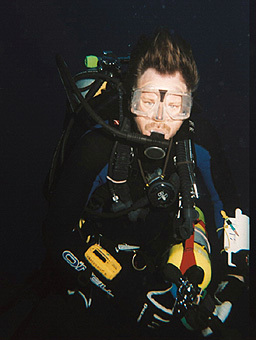 In 2002 and 2003 we went to Canada to dive the shipwrecks in the St. Lawrence River. Some of these wrecks are as deep as 250 feet and the currents can be just as unforgiving as those in Florida. I left my camera at home for most of these dives due to the fear of the "what if's." Sometimes in technical diving, due to things going very wrong, you have to be willing and able to cut away equipment if you have a problem during the dive; either on long drifting decompression hangs or if entangled while inside a shipwreck. In my mind cutting away an expensive camera system was not an option. Over the past several years my interest in reef diving and digital underwater photography has surpassed my desire for extreme depth. That doesn't mean that I'm done with tech diving, I would never pass up the opportunity to jump a deep wreck. But doing five dives a day on a live aboard dive boat allows me the opportunity to take so many more high quality photographs than the one dive a day you get when doing heavy decompression diving. Up until a few years ago, most of my diving had been land based and primarily centered around South Florida and the Caribbean. The one nice thing about land based diving is that it gives you a chance to do some sight seeing when you are not diving. On some of my most recent dive trips I have purposely spent more time out of the water than normal just for this reason. When you think about it, how often will you make it back to the same island twice? I think you should try to capture as much of your trip on film as you can; after all, half of the fun of taking a trip in the first place is sharing the memories of it with others. For the future, I have plans for more live aboard dive trips as well as land based trips in the Southern Caribbean, Red Sea and the islands of the South Pacific. December 1975 - St. Croix, USVI. 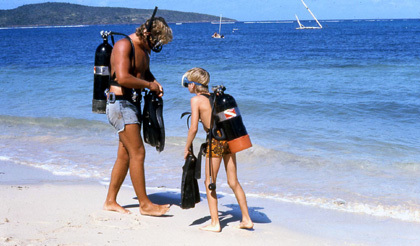 "My very first open water beach dive with Fritz"
December 1975 - St. Croix, USVI. 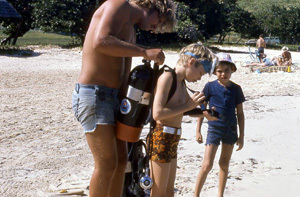 "Fritz, myself and my brother on the beach before my first open water dive"
December 1975 - St. Croix, USVI. 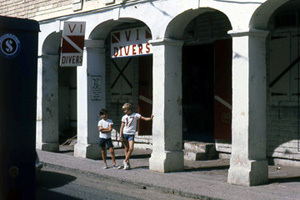 "Me and my brother in front of the Virgin Island Dive Shop"
July 2005 - Little Cayman, BWI. "Gearing up for another dive at Bloody Bay Wall aboard the Cayman Aggressor IV"
decompression dive on the Hydro Atlantic shipwreck"
June 2006 - Bermuda. 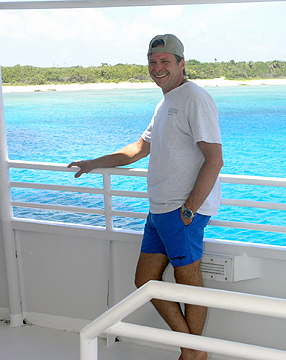 "Diving the Cristobal Colon wreck "
July 2005 - Little Cayman, BWI. "The Cayman Aggressor IV"